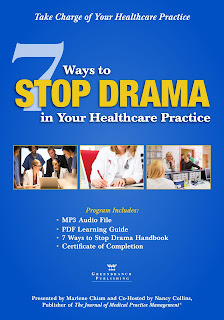 An excerpt from 7 Ways to Stop Drama in Your Healthcare Practice. Originally appeared at www.kevinmd.com July 7, 2018. Although the ability to initiate difficult conversations is part of good leadership, I’ve never met a leader who enjoys it. Whether your conversation is about body odor, rude behavior, dress code, personal conduct or performance issues, difficult conversations are something that most of us avoid. In reality, the primary reason we avoid difficult conversations is that many of us lack the skills we need to handle such situations. As a health care leader, your intention must be about improving performance for the betterment of the practice, period. Anything else is just drama. I’m going to give you an overview of the steps to use in initiating a difficult performance conversation. This advice comes from years of observing all types and all levels of leaders who have struggled to give valuable performance feedback to their employees until it was too late. If you use this process correctly, 90 percent of the time, employees shape up and get better, or they leave before you have to fire them. The intention should be twofold: to help the employee and to help your health care practice. Even good leaders have hidden intentions without realizing it. If you have let a problem go on for too long, your hidden intention may be to embarrass the employee, fire her or put her on a difficult rotation. Know your intention before the conversation commences. My colleague doesn’t care about the practice. My employee thinks he can get one over on me. She doesn’t respect her coworkers. These statements point to your labels, assumptions, and judgments but not necessarily to the facts. “He has a bad attitude.” Evidenced by frowning, eye-rolling and interrupting. “My colleague doesn’t care about the practice.” Evidenced by consistent tardiness; not volunteering for overtime during the holiday rush. 1. What is the employee doing that you want him or her to stop? 2. What is the employee not doing that you want him or her to start? There’s a reason you want Karyn to change. That reason is not just because you get irritated when Karyn doesn’t smile. That’s your personal issue. You want her to change because on the last survey you got a low score on patient satisfaction. That’s the business case. The point I’m making here is that you have to connect the dots about how the observed behavior affects the business results, not your personal life. When you make it clear that your focus is on improving the practice, it’s easier to get alignment from employees, owners, and physicians. Now that you know the observable behavior and the business case, you have to be able to ask for what you want. Asking for what you want is difficult because most of us focus on what we don’t want. Many times we say things like, “I don’t want to have to tell you a thousand times,” or “I don’t want to argue.” Asking for what you want is the starting place for speaking the vision. Before meeting with your colleague or employee, you may not know for sure how to get to the root of the problem. Even if you know how to articulate the observable behaviors clearly (e.g., the employee misses documentation, frowns, interrupts or fails to ask the patient the correct questions), you still may not know why they do it. Makayla is making errors with patient records. Makayla may not be aware of how her behaviors affect the team. But let’s say Makayla continues to make errors when documenting patient info, after the conversation to correct has taken place. The errors could be occurring because she was not trained properly. Maybe Makayla is confused because there are too many bosses and she doesn’t know which one takes priority. Maybe Makayla gets overwhelmed, and instead of checking patients in she starts straightening up the reception area because that relieves her stress. If you’ve ever had a difficult performance conversation and you thought you got through to the employee, but you saw no change, it is either because the employee resists your leadership, or you resist implementing measures of accountability. Let me tell you what Kim did. My coworkers won’t like it. Distractions are sidebar conversations intended to get you off topic so that you are no longer in charge of the conversation. Until there is a willingness on the part of the employee to change nothing is going to happen. You have to be able to address their resistance, but you also need to look at your own resistance to holding them accountable. Once you have made an agreement with the employee about what the problem is and what you need the employee to do, the last step is to follow up. Here, you simply put on your calendar a check-in date to discuss his or her progress. The feedback system keeps a focus on improvement while increasing your credibility and trustworthiness. Marlene Chism is the author of 7 Ways to Stop Drama in Your Healthcare Practice and can be reached at her self-titled site, Marlene Chism.